Post World War II, the German manufacturing sector and economy attempted to pick itself up – but it was a pretty rocky road. Still, as early as 1950 Western powers were pronouncing the ‘Wirtschaftswunder‘ in the Western side of Germany – a phoenix-like rebirth of the economy overseen by Chancellor Konrad Adenauer. Despite this, it would be decades until this wealth and prosperity really filtered down to the average worker. As a result most drivers in Germany were relegated to very small and efficient cars, with the Volkswagen Beetle being the most successful. But it was far from alone. 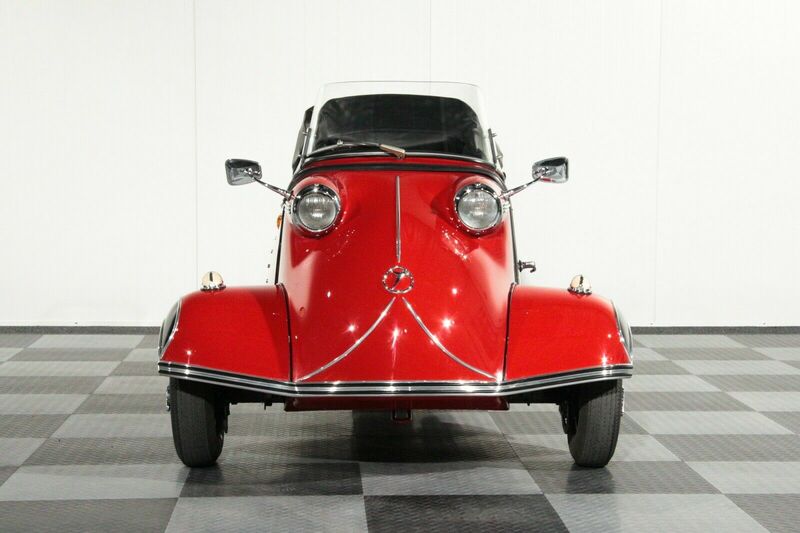 We are very proud to present this extreme rare Messerschmitt coming out of long term ownership. According to several sources only 300 pieces KR201 Roadster have been build. Very little of these 300 have survived making original examples real rarities. 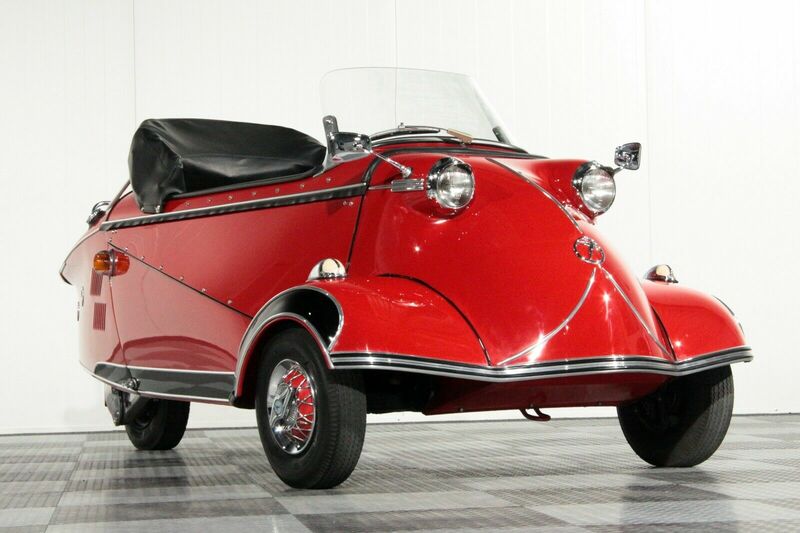 For almost 50 years this Messerschmitt has been owned by a true enthousiast of the brand. Now at a certain age and after some hesitation he decided to sell his treasure. A original and complete KR201 is a rarity, a pristine condition KR201 is next to impossible to find. RM Sothebys sold a terrific original and correct example at auction back in 2013 for a staggering 103.500 =US$. This “Kabine Roller” has it all. 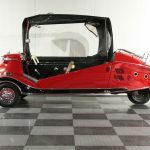 The Roadster was a limited-production special edition, which had, in addition to its completely demountable convertible top, numerous equipment upgrades. The interior was in black, the first time that color was used, with striking accents in a faux-snakeskin pattern, highlighted by bright red piping throughout. 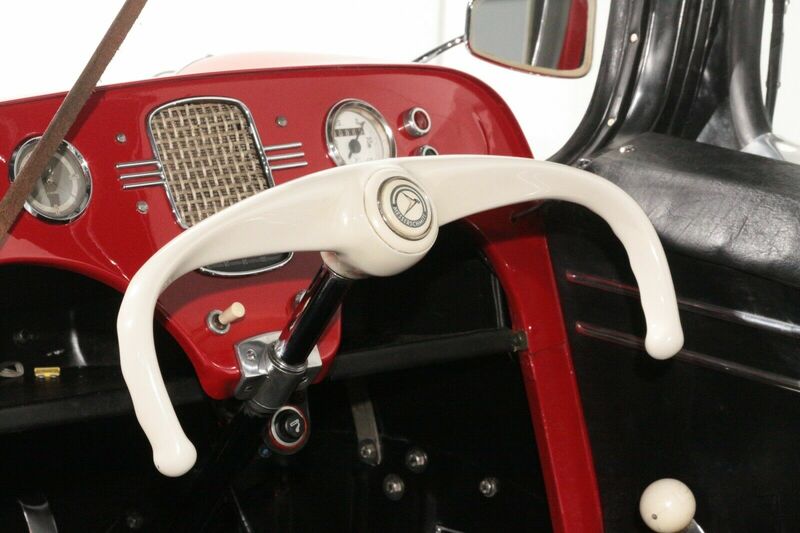 The leather belt was in white, and the shift lever was in chrome and had a white knob. The dash panel layout followed the new 1957 specification, with a cream ashtray in place of the clock and a rearranged switchgear incorporating a new light switch. The radio opening had special white speaker cloth under its chrome wire mesh grille. The roadster body featured fender lamps and on the engine lid there were portholes, as well as new curved-arm Kontakt mirrors exclusive to this model (and later to the Tiger), which were seen on the headlight pods. New slotted hubcaps with twin-eared spinners added sparkle to the wheels. A measure of protection from the rain was provided by a set of roll-up, soft, clear, vinyl side screens, which attached by press-snaps, the front portion of which could be folded back and held open by a pair of double-sided snaps. The Roadster was finished in a new shade of bright red unique to this model, called Signal Red. In some markets, like England, this was the only color offered, but the home-market cars were available in white also. This example was restored with maximum attention for originality. The original snakeskin pattern fabric was reused. All special items like fender lamps, portholes and mirrors were revised like they were in 1963 when new. The roadster has been used regurarly by the last owner and is in a superb running condition. Engine, gearbox, suspension, electrics and brakesystem have all been revised completely. An original user manual accompanies the car. This must be one of the finest examples in the world currently for sale and will be welcome at any concours or classic car event. 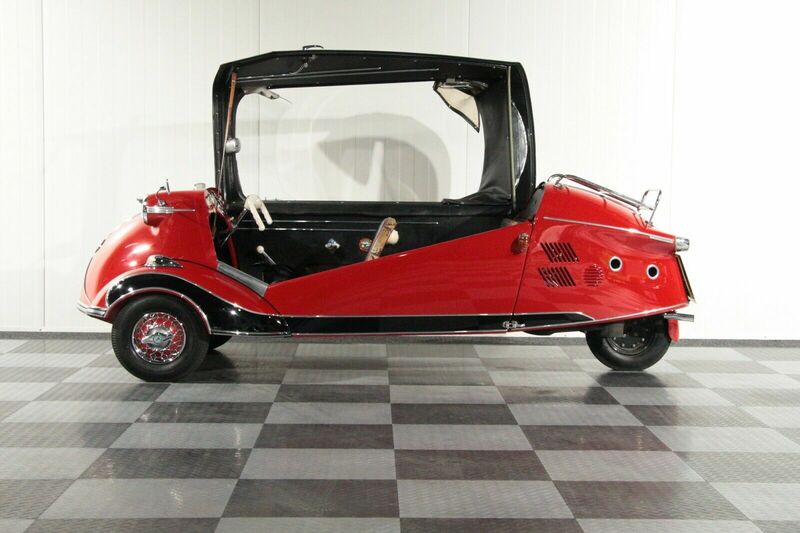 Do not miss out on this rare oppurtunity to buy a piece of microcar history. We can assist with worldwide shipping of this or any of our other classics. 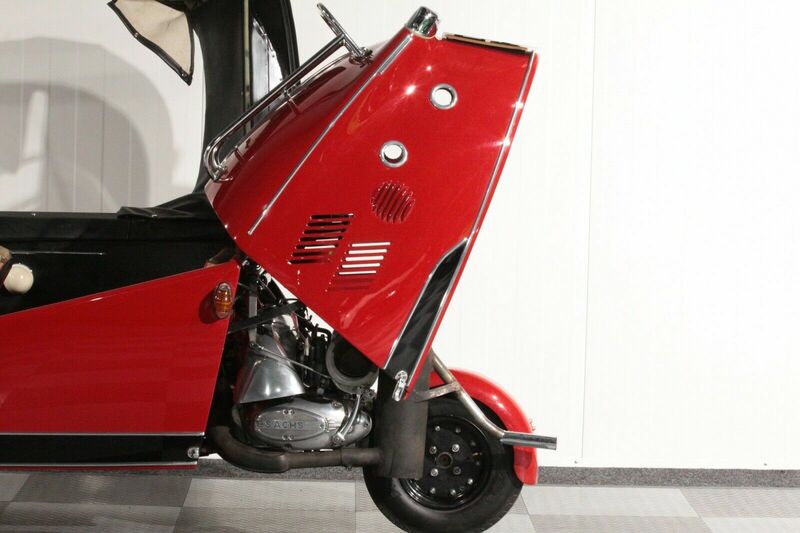 The designation KR stands for Kabinenroller, which literally means cabin scooter. 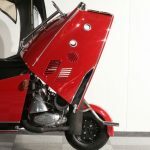 And that’s what this was – a 191 cc two-stroke scooter motor with two tandem seats and a cockpit cover. 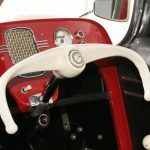 The engine was operable in both directions, meaning you had 4 forward gears and 4 reverse gears by changing the direction of rotation of the engine. To turn, the steering bar slid side-to-side. Clear canopies hinged at the side, and there were no doors. 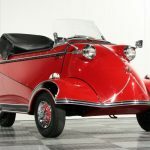 With only 9.9 horsepower, 65 mph was theoretically possible but the KR200 could return almost 90 miles on a single gallon of gas. This was about as unconventional as a car got. The KR175 was the early model, with somewhere around 15,000 produced. Revisions in 1955 yielded the KR200 model which sold over 30,000 units, while the KR201 Roadster came out last and was the least produced with this seller claiming only 300 were made. This one looks like a good restored example overall, and while KRs are rare to find at all, the Roaster is especially so. At first, the $60,000 asking price may seem absurd. But consider that RM Auctions just sold a 1959 KR200 at Amelia Island for $84,000. It may seem crazy that there’s a market for this car, but the collectors are clearly out there. 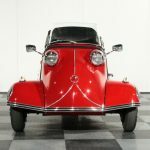 Tagged 1963, KR175, KR200, KR201, Messerschmitt, oddball, Rare, Roadster, Sachs.